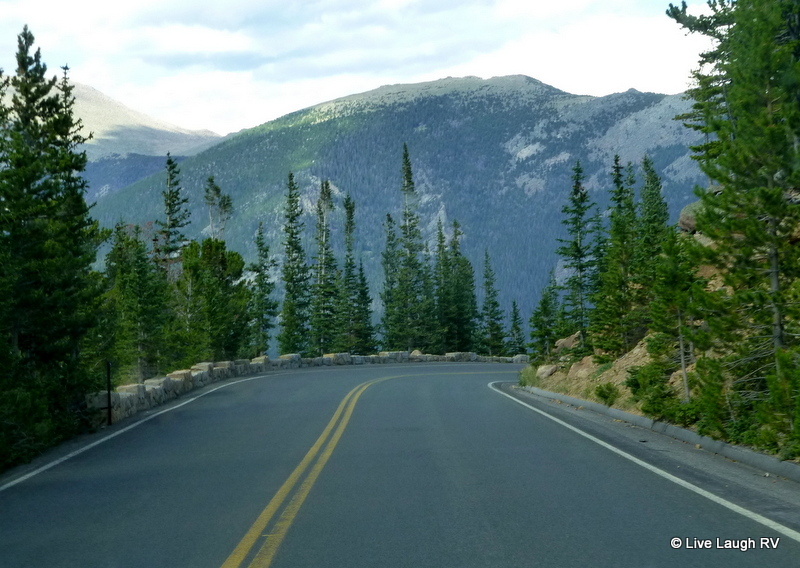 Our drive continued up Trail Ridge Road through Rocky Mountain National Park. 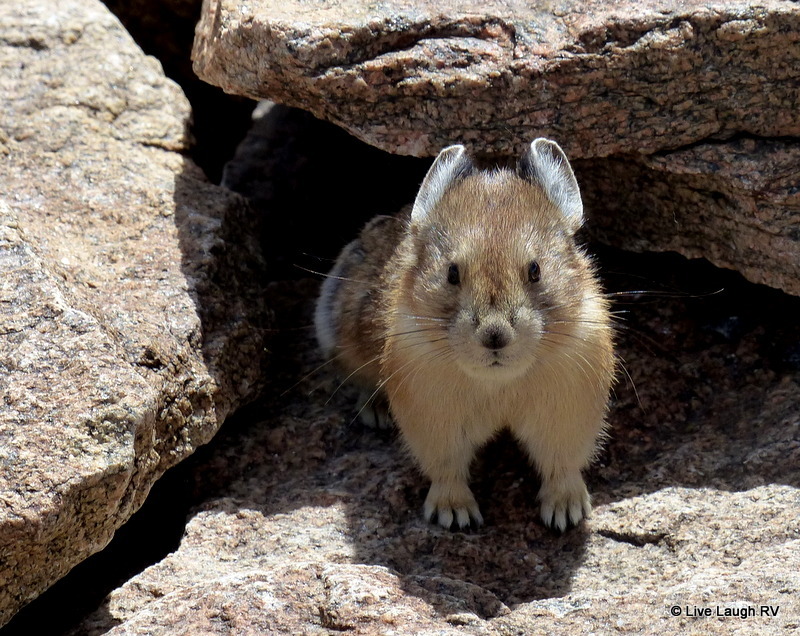 Hubby and I could not contain our smiles after watching the cute little Pikas darting amongst the boulders and through the alpine tundra wildflowers. 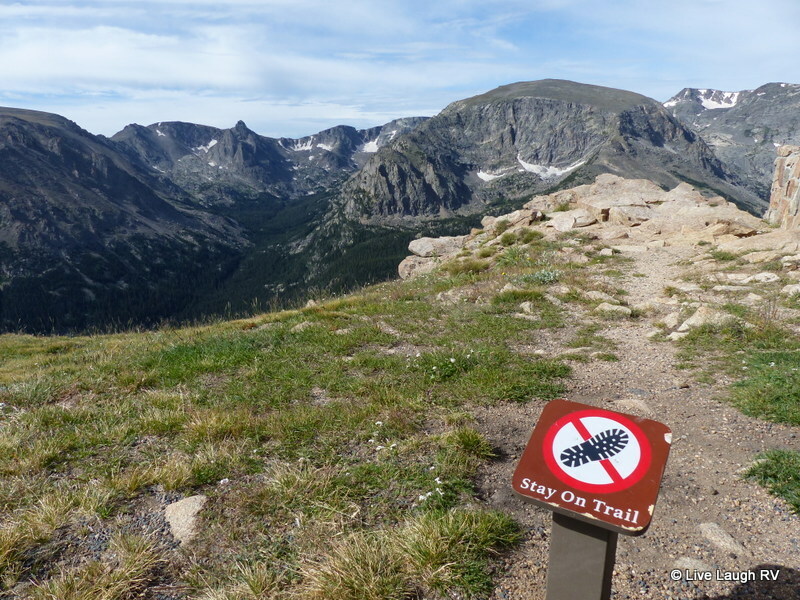 If it weren’t for the high altitude making me feel a tad woozy, I would’ve stayed on that trail all day. 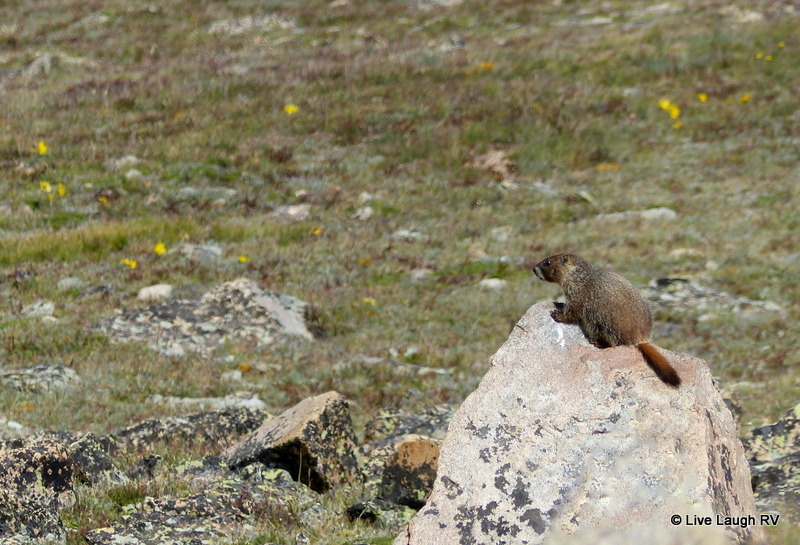 Yep, pull up a chair and watch the Pikas and Marmots scurrying about the tundra! Yes sirreee, I’m easily entertained. 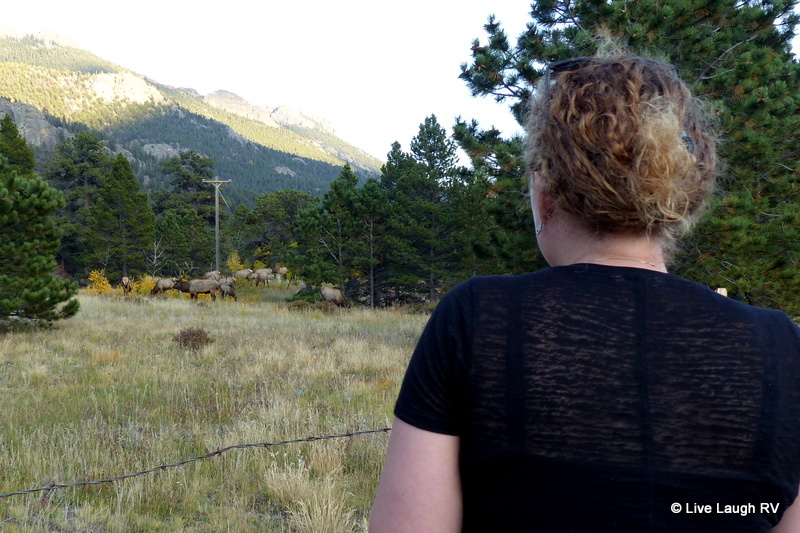 Al and I could sit for hours and watch wildlife. So hubby was equally enthralled. 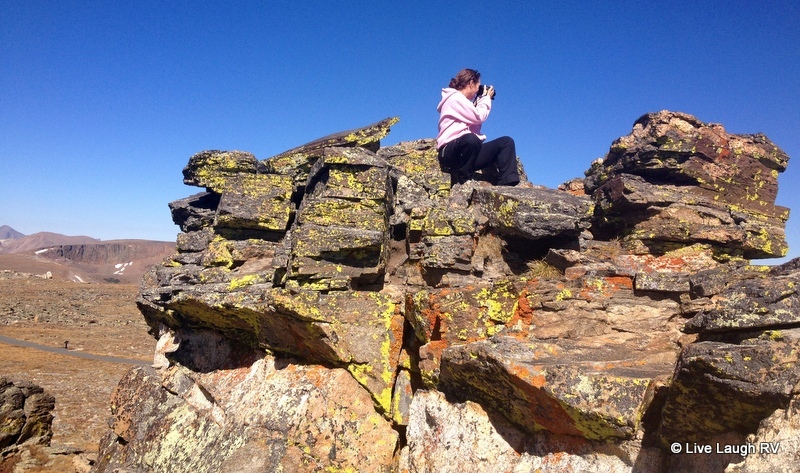 We tore ourselves away from the Pikas and continued our journey, but we didn’t get far. We saw folks with pointed cameras and a couple of park volunteers donned in orange vests standing along the side of the road. I quickly found a place to park and joined the group. 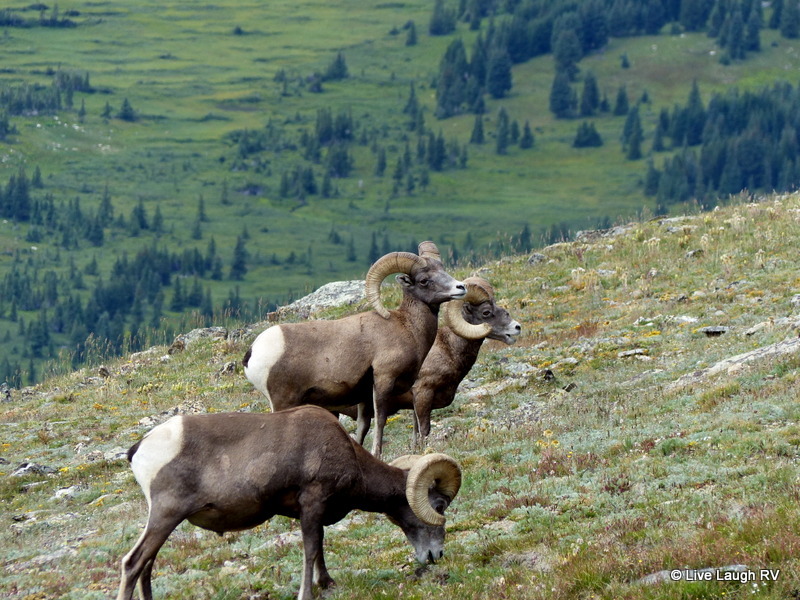 The three male bighorn sheep were magnificent. The orange clad volunteers directed traffic as well as ensured tourists maintained a nice distance from the animals. 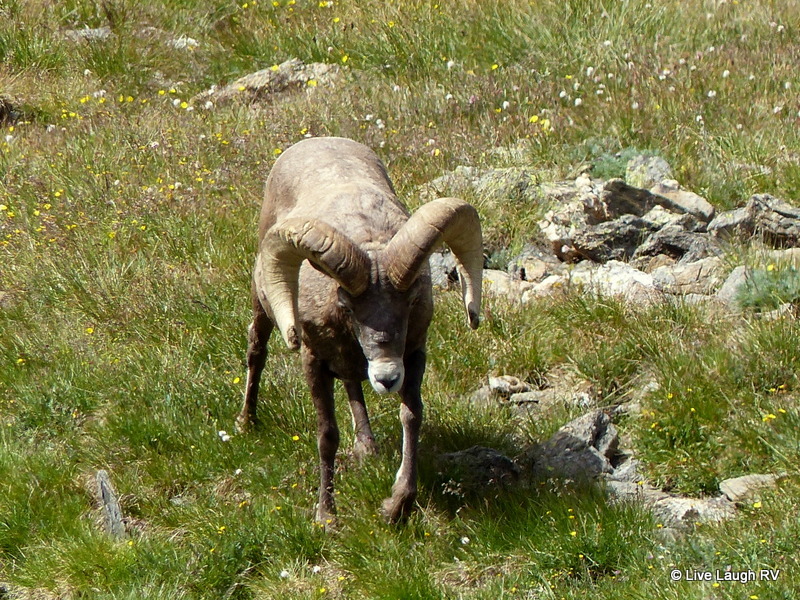 It was clear the bighorn sheep were used to visitors. They were more interested in munching the meadow grasses than they were in the shutters snapping. 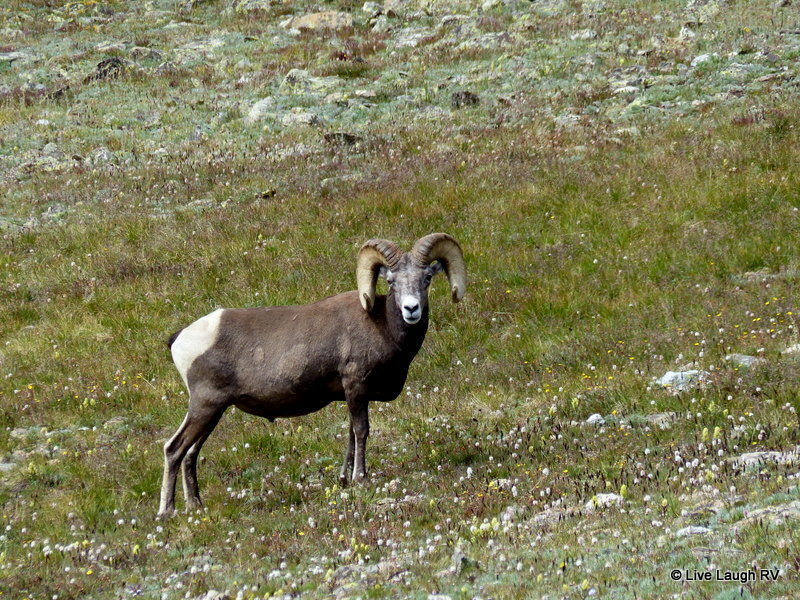 Supposedly, the area near Iceberg Pass is a popular location to spot bighorn sheep. 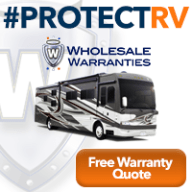 Moving on …. 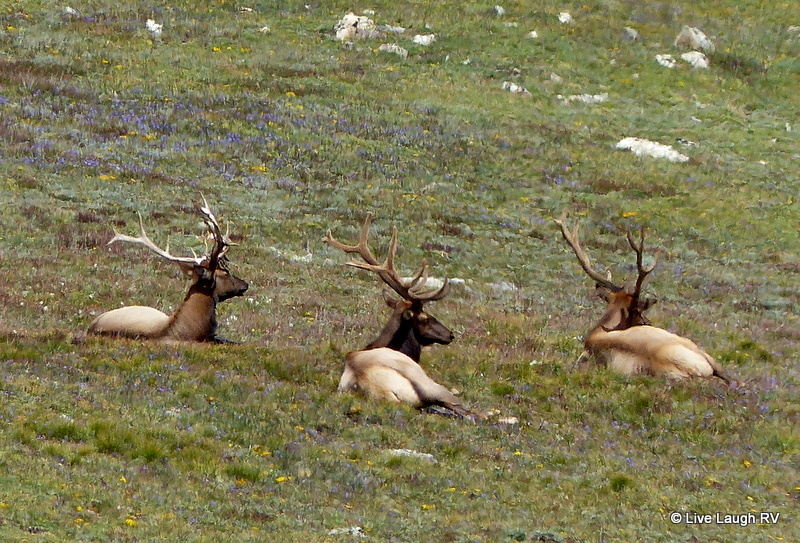 Near the highest point on Trail Ridge Road (12,183 feet – 3713 m), we spotted a herd of Elk in the distance. 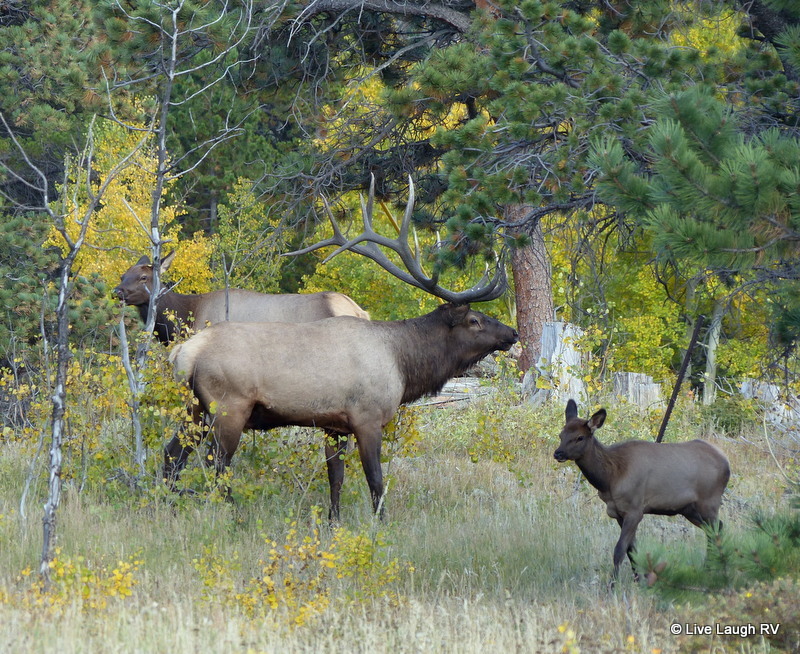 We were getting accustomed to seeing Elk in the park, but those antlers were never the less impressive and check out those wildflowers – they sure were pretty! 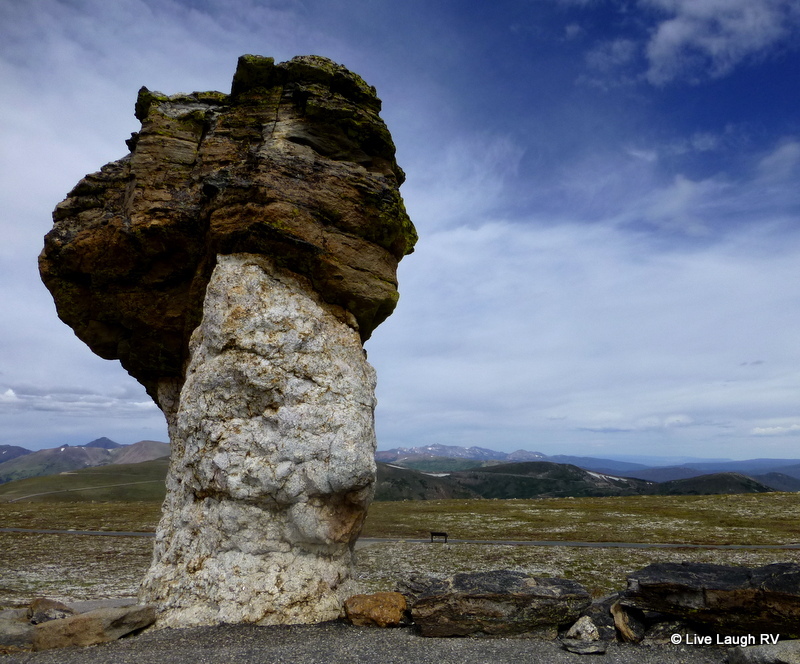 We took a pass on stopping at the Alpine Visitor Center and continued our trek toward the town of Grand Lake crossing Milner Pass and the Continental Divide. This marks the location of the direction of water flow. All creeks and rivers on the east side of the divide flow easterly toward the Mississippi River and Gulf of Mexico or Atlantic Ocean. Creeks and rivers on the west side of the divide including the Colorado River flow toward the Pacific Ocean. 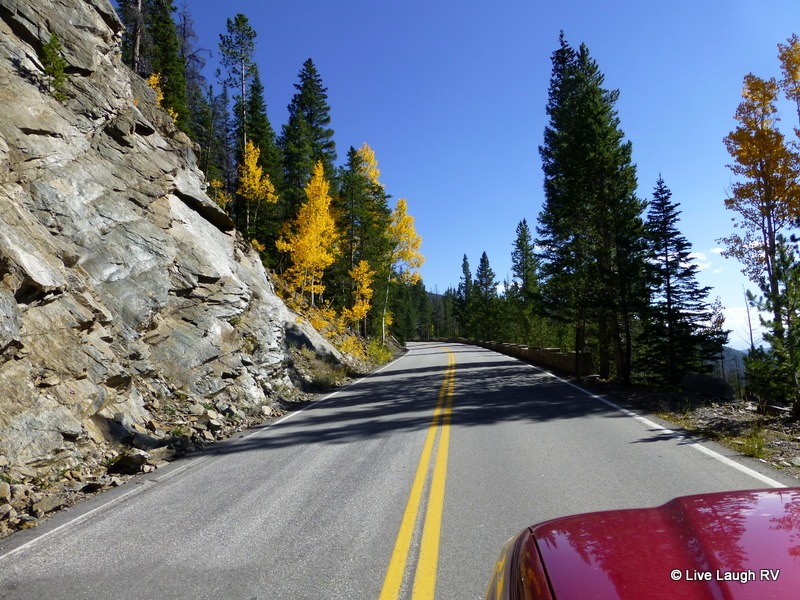 Shortly after Milner Pass are a series of five switchbacks that helped us navigate the 2,000 foot drop in elevation to the town of Grand Lake. 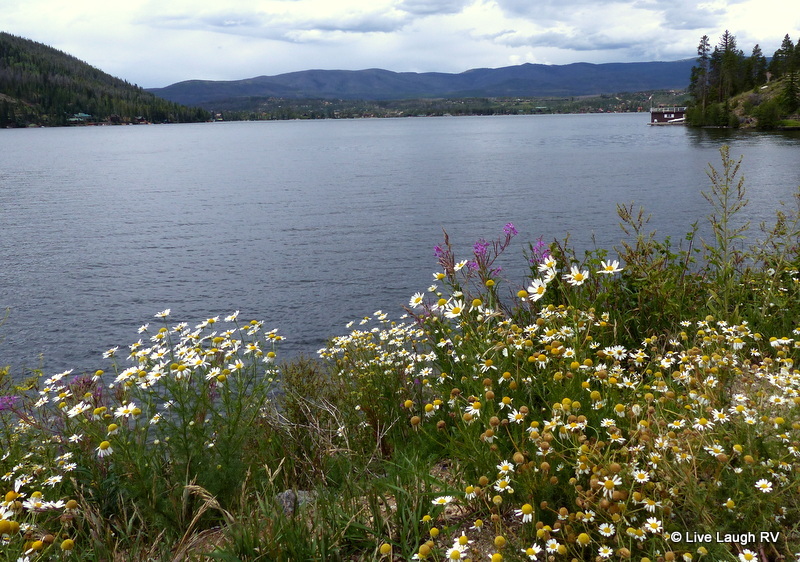 We found a nice place to stop along the shore of Grand Lake to enjoy our picnic lunch. It didn’t take long before we were joined by company looking to mooch a morsel. 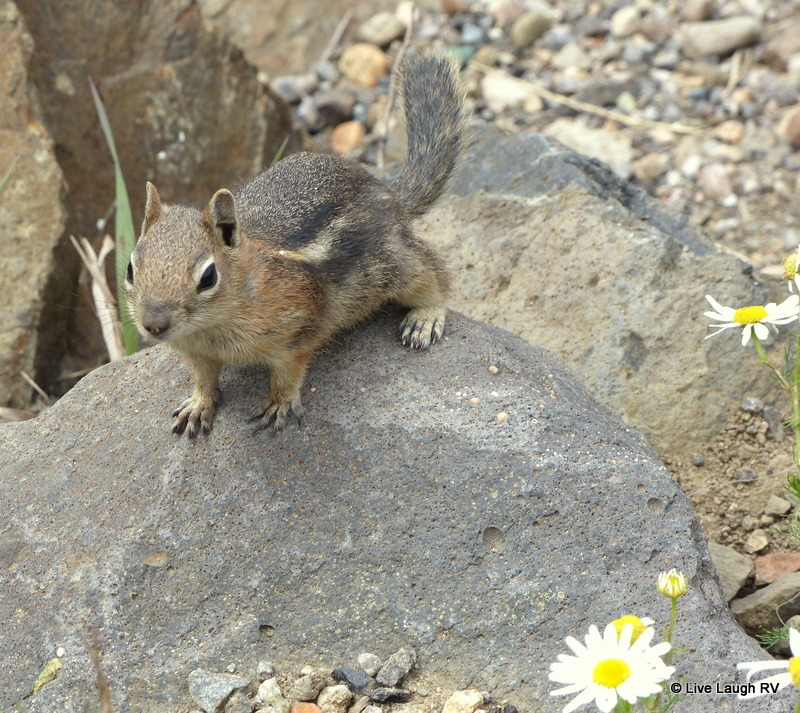 One of these chipmunks was running across Al’s foot and even started begging. When we threw him some lettuce leaves he actually had the audacity to spit out my fresh, organic butter lettuce. Then another chipmunk came over and tried the lettuce. He too spit it out. “Well guys…. if you were looking for junk food, you picked the wrong couple”. Al and I have been trying to eat a little healthier lately and feeling much better for it. Perhaps sometime I’ll post about our Paleo diet, but for now I’ll just say it’s made a huge difference in our overall health. 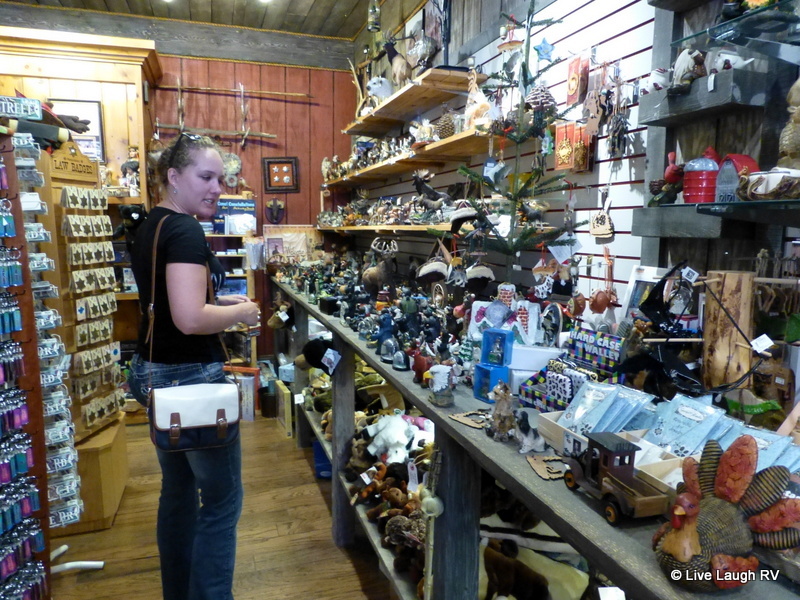 After a very enjoyable lunch, we headed into town to stroll some of the shops. Grand Lake is a small town that Al and I would visit each winter when our family of four would spend the Christmas holiday near this part of Colorado. Ah yes, wonderful times. 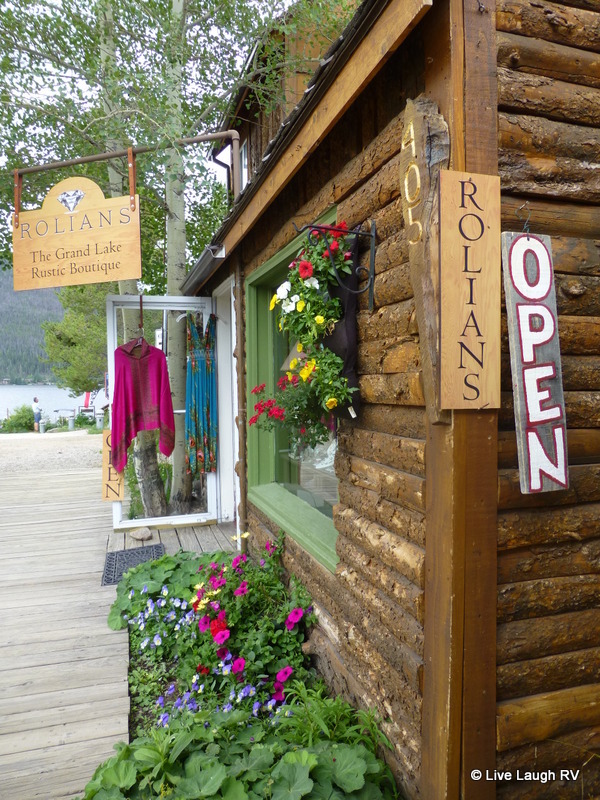 This little mountain town will always hold fond memories for us….. new and old. While I made a quick dash to the Ladies room, Al stepped into one of the shops and upon my return, he surprised me with a gift. You see, my birthday was just a few days away and hubby decided to surprise me with a necklace. Five years ago I might have questioned his taste … I much prefer a combination of gold and precious gems, but our new lifestyle is so different from that of our suburbia world that most of my fine jewelry was either given to our daughter or sits in storage. I was almost brought to tears by the lovely sterling silver moose hanging from a silver chain. A moose necklace; how perfect. Al and I have been together well over thirty years, and we stopped doing the surprise/gift thing a long time ago and I’m totally fine with that. As a matter of fact, I’m pretty sure it was initially my idea. Anyway, I found the gift very touching and adding to an already amazing day. But the cherry on the sundae was yet to come as the guy in the fudge shop (yes, you read that right ‘fudge’. 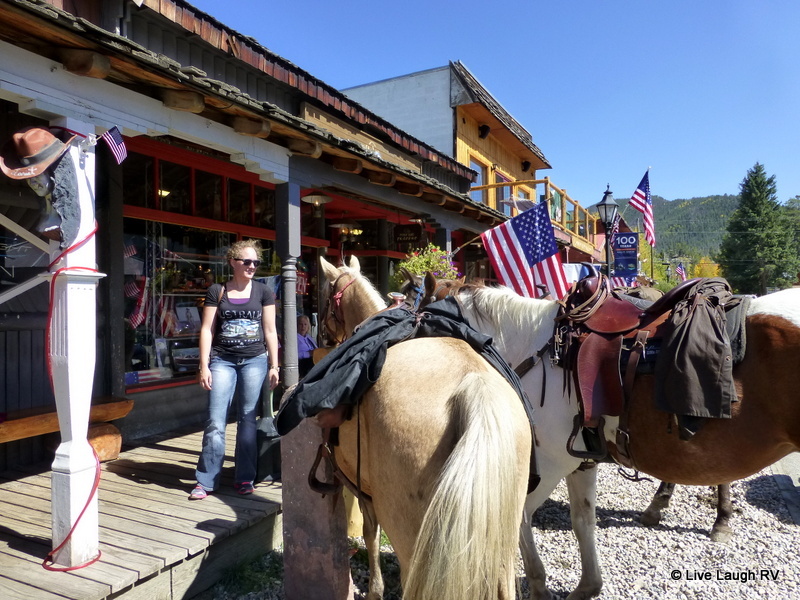 Chocolate IS healthy and we’ll leave it at that)….. the guy in the fudge shop recommended we drive down Columbine Road if we wanted to see moose, thus off we went. We drove around the residential neighborhood for about 15 minutes before deciding to call it quits. We had a long drive ahead of us back to camp and figured we would just have to return next summer to focus on that moose hunting. 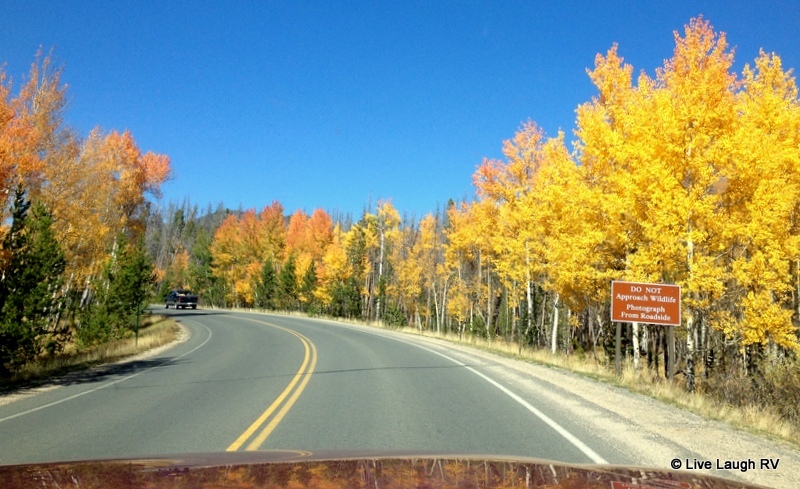 I no sooner turned the corner to head to the main road when Al urgently said, “Wait….. look”. 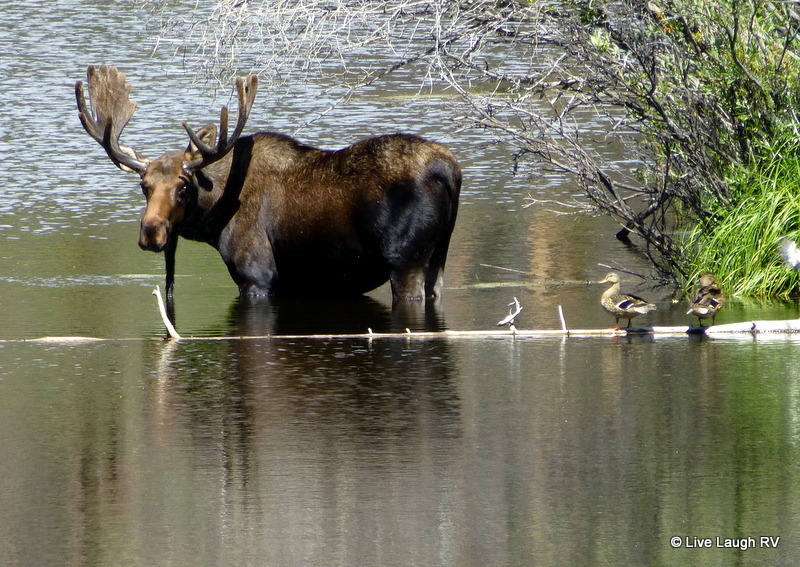 I glanced between two houses out into the water, and there he was …. 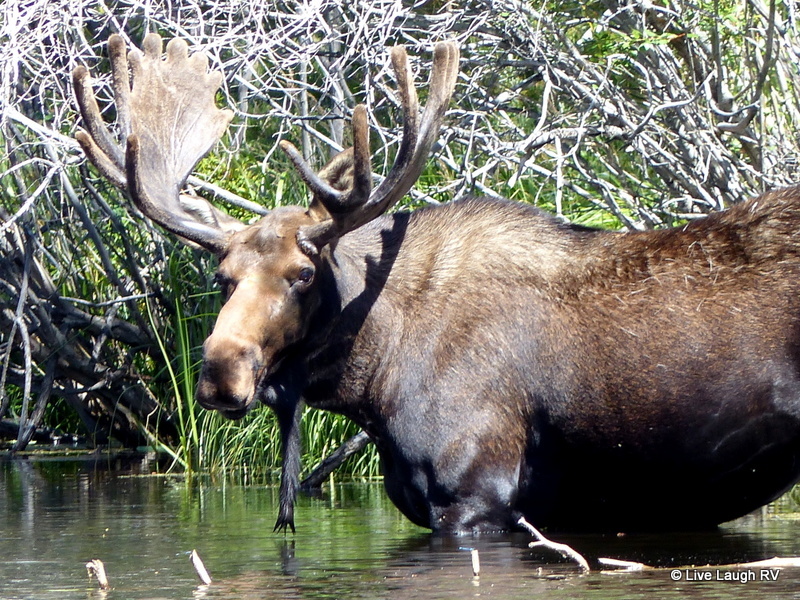 the largest moose I had ever seen. He was standing in the water munching away. I couldn’t get the little truck pulled off the road and parked quick enough. Isn’t he gorgeous? Oh my gosh, this was definitely the icing on the cake, cherry on top, pièce de résistance turning this day into one heck of a perfect day. 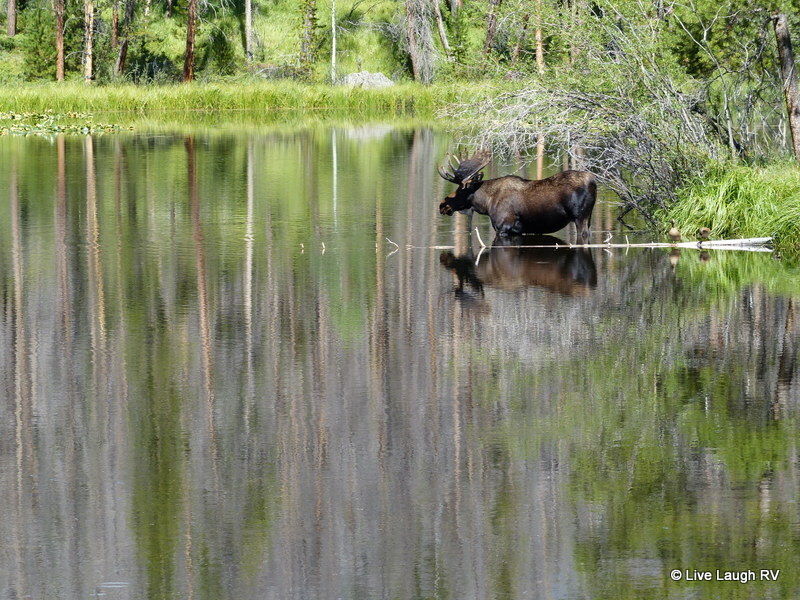 Boy, did we hit the Mother load of wildlife that day; pika, marmot, elk, bighorn sheep, and now a moose! 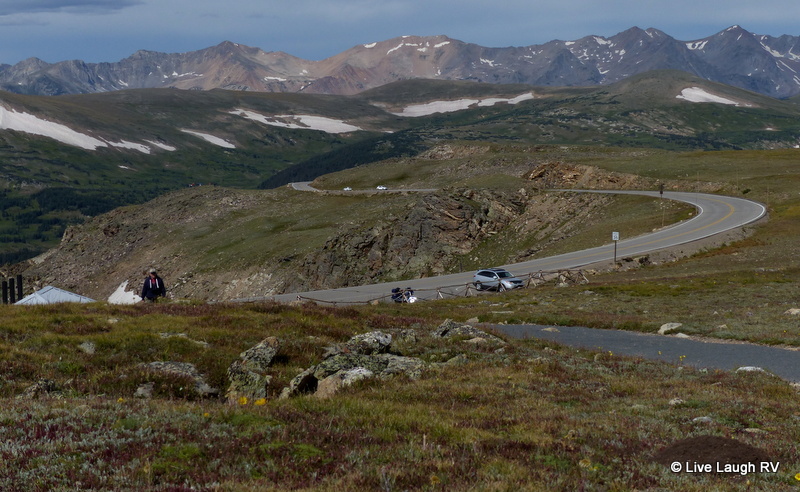 It was tough pulling ourselves away, but we still had to cross the Continental divide back over Trail Ridge Road to get home to the Glacier Basin Campground. 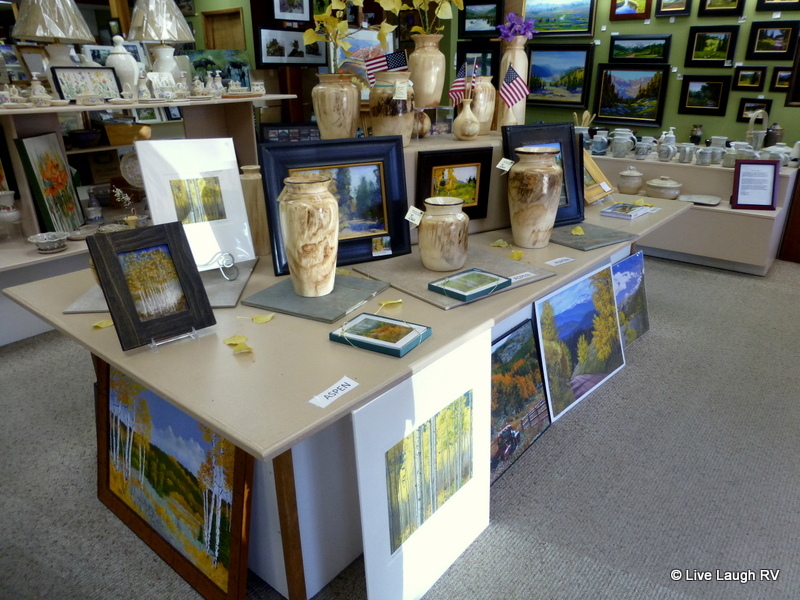 What a fabulous day it was …. sheer perfection. A day I won’t forget. We’ve all experienced those days when nothing seems to go right, you know Murphy’s Law and all, but then there are those days where everything comes together perfectly. 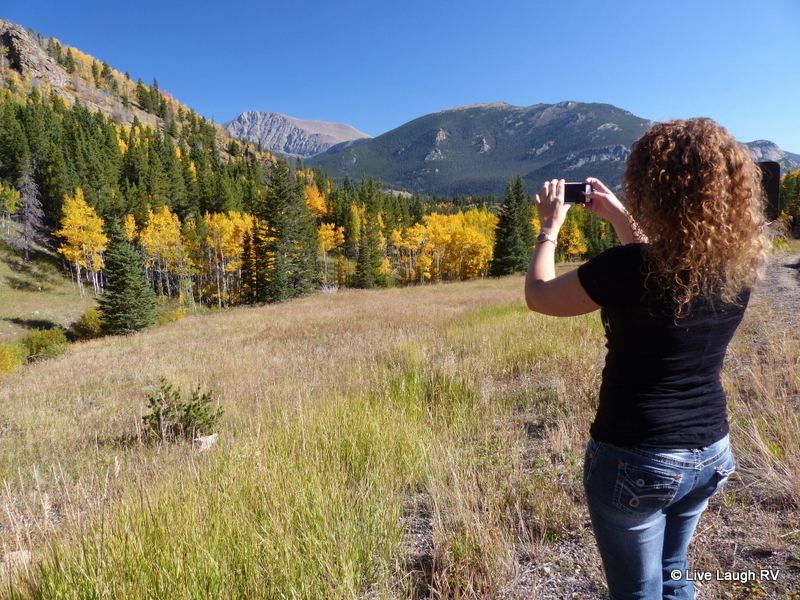 Our last full day in Rocky Mountain National Park was just that; a nearly perfect day. After three consecutive days of hiking, we opted to take a break from the trails and take a scenic drive. 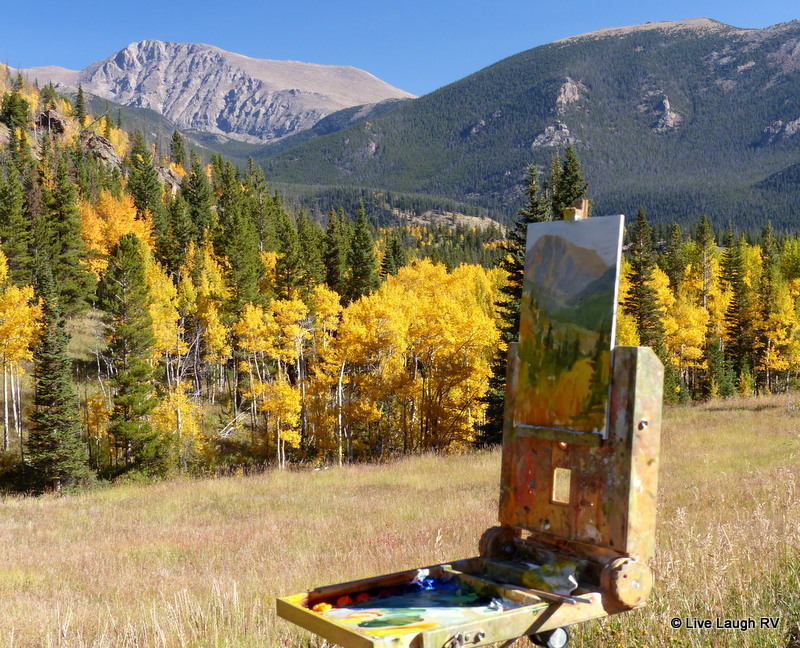 Trail Ridge Road is known as the highway to the sky and stretches 48 miles between the towns of Estes Park on the east side of the Continental Divide to Grand Lake on the west side. 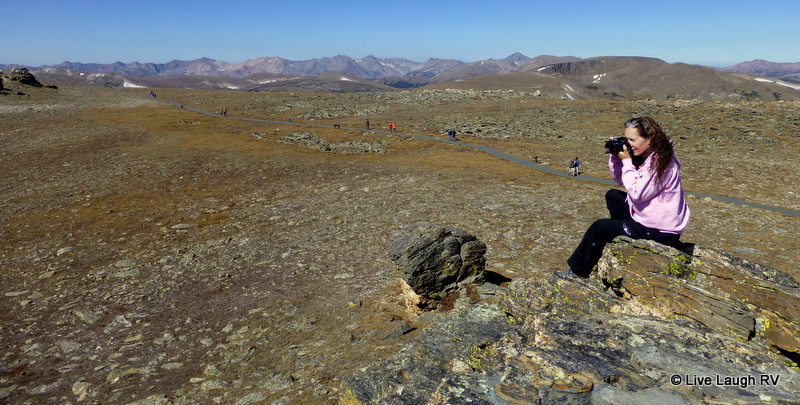 There’s an eleven mile section that traverses above tree line with the high point being at 12,183 feet in elevation. 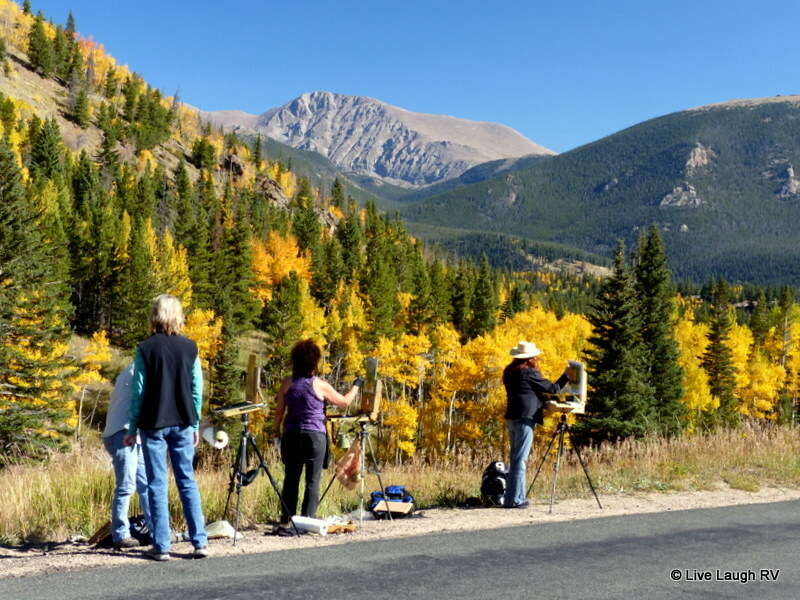 There are numerous scenic pull-outs along Trail Ridge Road and all worth stopping at to take in the amazing scenery. 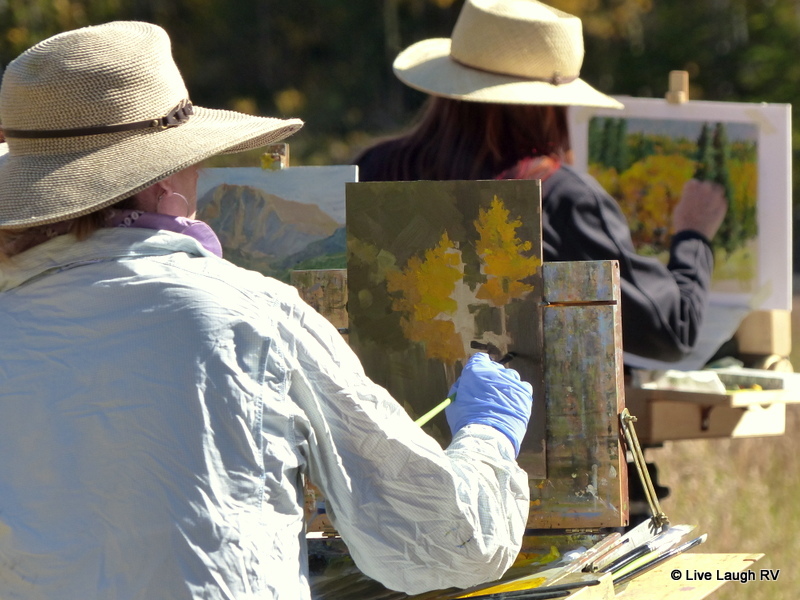 This is a great way to enjoy a sweeping view of the Rocky Mountains in all directions. 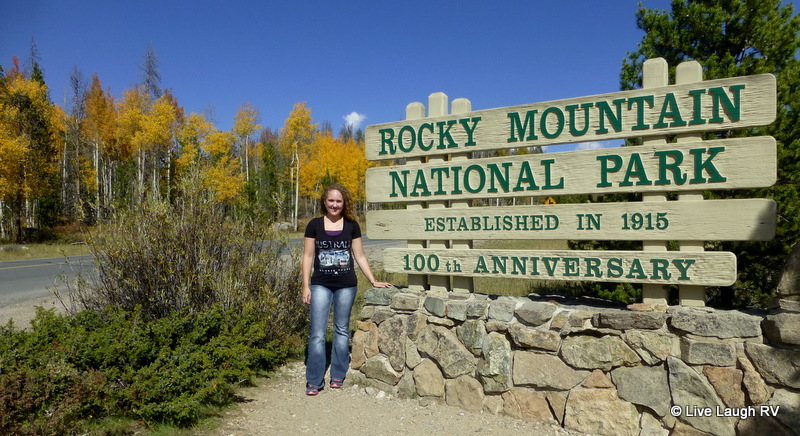 Since we’ve had the privilege of visiting this National Park several times previously, we knew to plan the entire day to truly enjoy all that this scenic drive has to offer. 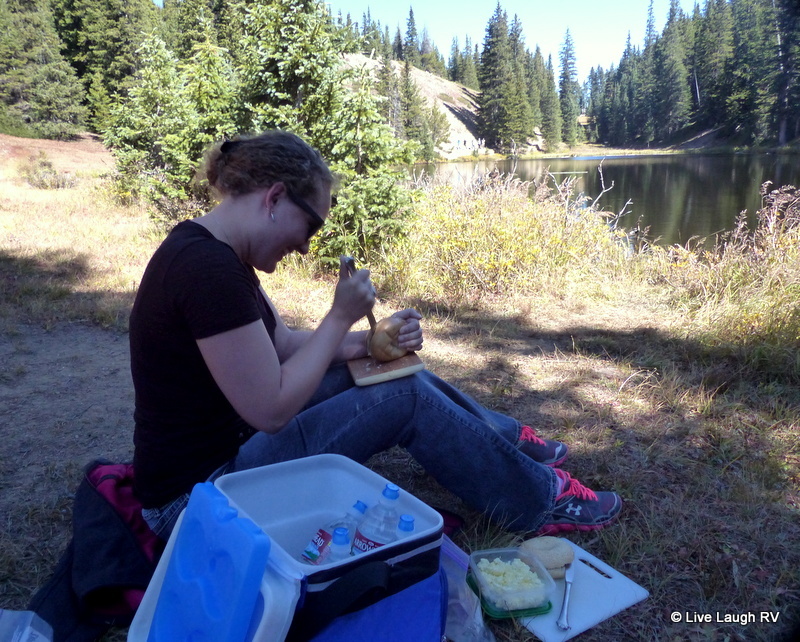 We packed a picnic lunch allowing us time to meander without a schedule. 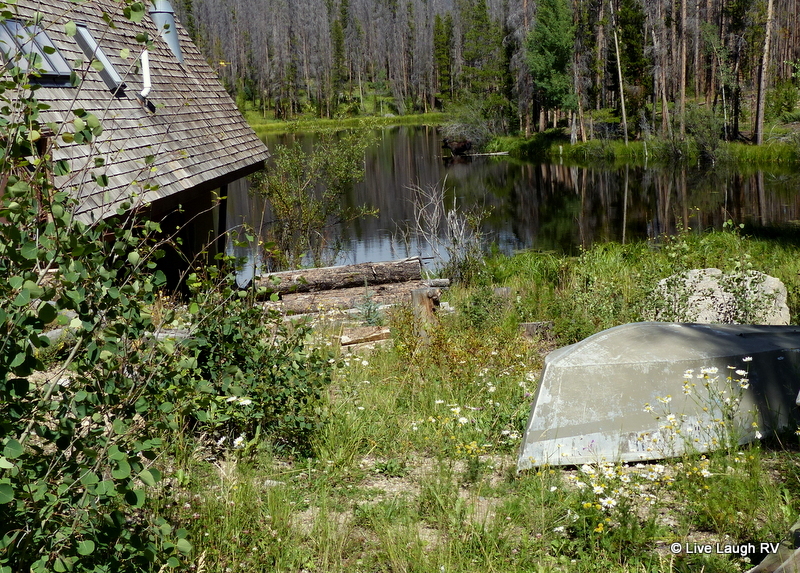 We left our campsite at Glacier Basin Campground around eight in the morning. It was a beautiful sunny morning with a crispness in the air. Our first scenic stop was at Rainbow Curve. From this vantage point we were able to see the Alluvial Fan in the valley below. Continuing up highway 34 (aka Trail Ridge Road or as Al and I like to call it, Ogden Ave. As newlyweds, hubby and I lived near Ogden Avenue aka highway 34 in northern Illinois. So it’s kid of a joke between us) our next stop was the Forest Canyon Overlook. It’s August 18th and I’m glad I wore my earmuffs. 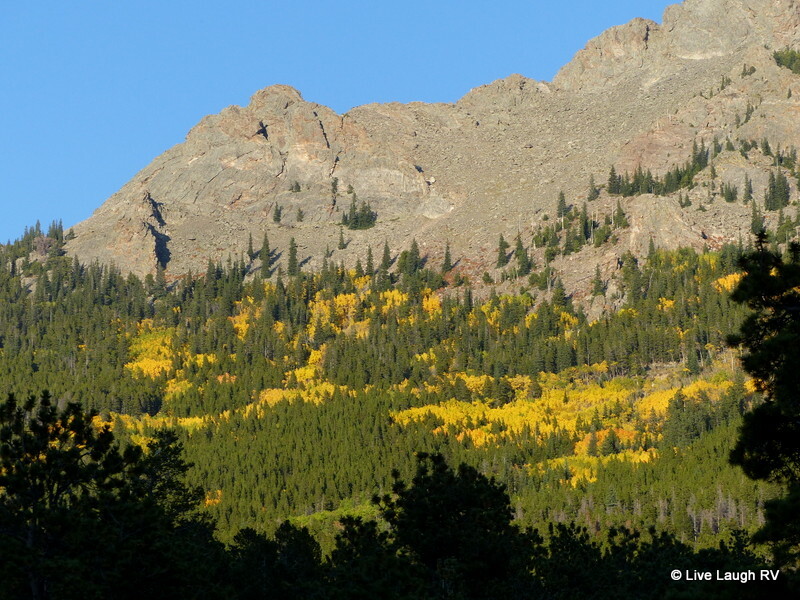 From the Forest Canyon Overlook there were spectacular views of some of the park’s remotest areas. 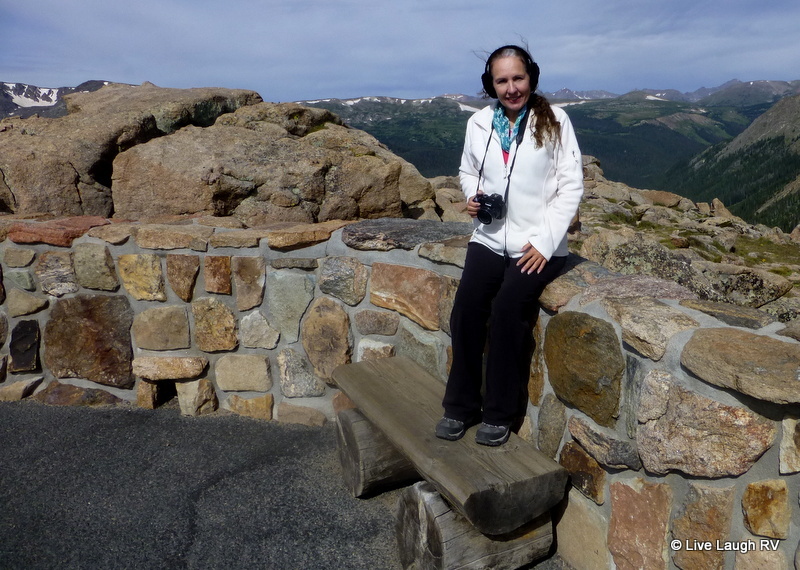 Because this scenic overlook sits at an elevation of about 11,700 feet, the views were directly in front or below me. 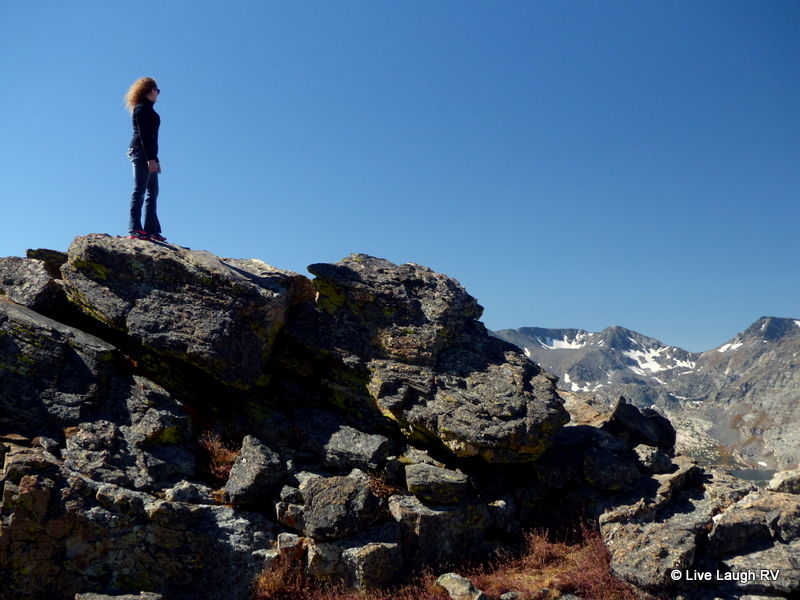 There were stunning mountain peaks in all directions. The winds were particularly gusty and cold during our stop and I was glad I donned my earmuffs. 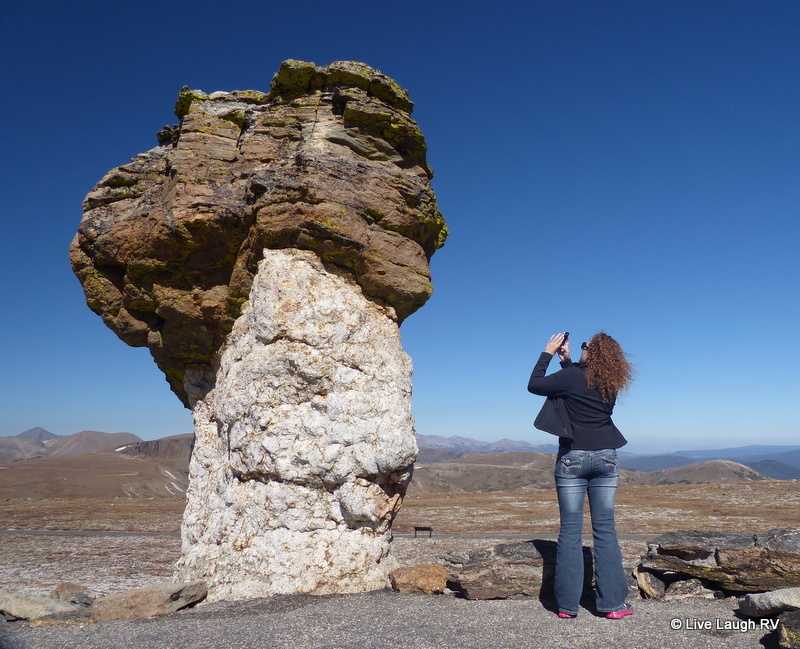 Trail Ridge Road, Rocky Mountain National Park. 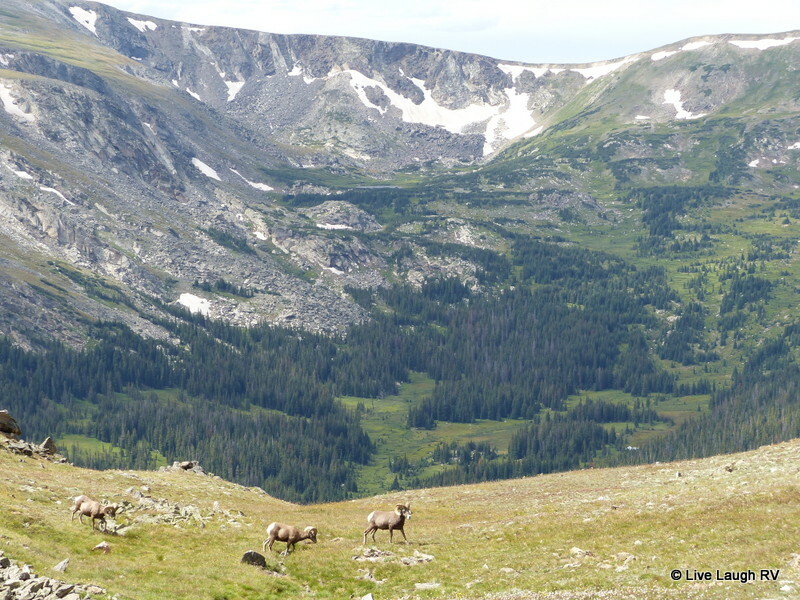 The view from the Tundra Communities Trail. 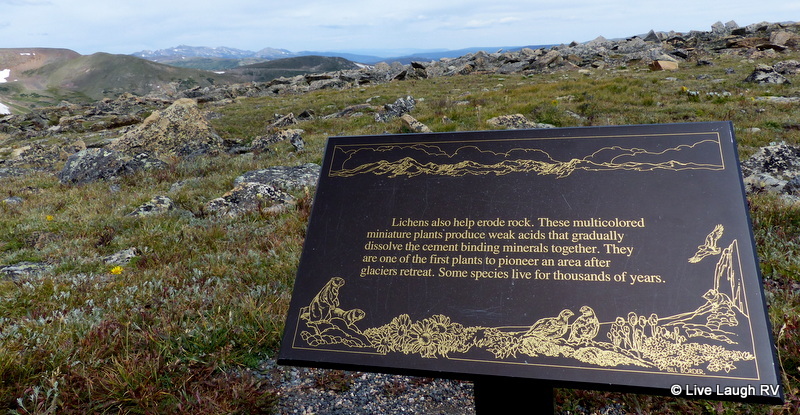 Our trek quickly continued just past Rock Cut to the Tundra Communities Trailhead. Although hiking wasn’t on the days agenda, a stroll was. 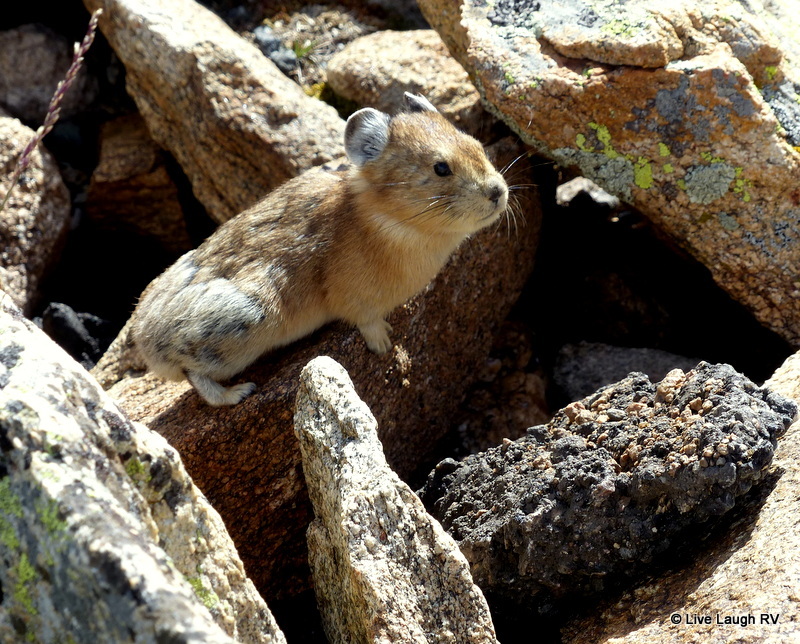 You see, ever since I read about Pikas I was on a quest to see these little guys up close and personal and this should be the perfect place to find the cute critters. Did you know they are related to rabbits? Aren’t they adorable? As we were about to pull into the parking lot, I noticed two birds flying very close to one another. Actually, a little too close and rather strange. I blinked to clear my vision and then asked Al, “Is that one bird or two?” Boy, did that get hubby’s attention as he urgently responded, “Of course, that’s one bird. Do you need me to drive since you’re experiencing some double vision”. “No, no I’m fine. Yes, it’s obviously one bird. I think I’m ok now”, I responded as we pulled into the parking lot. 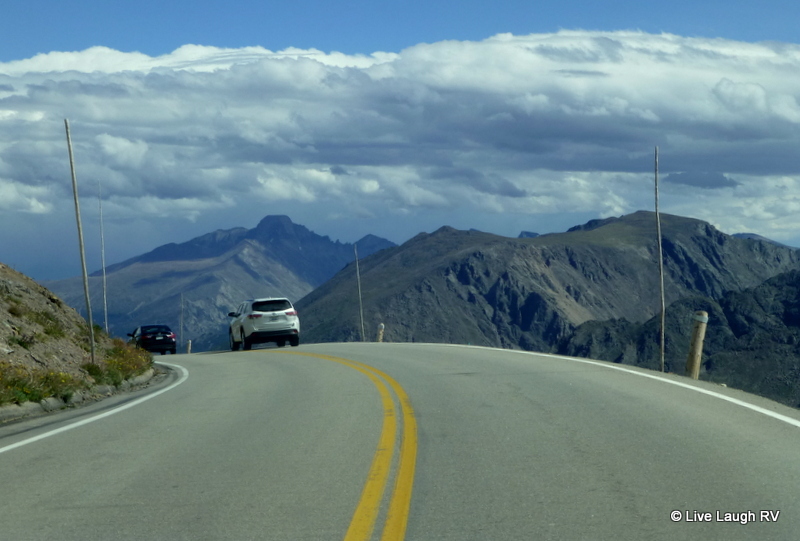 Keep in mind, we were driving a high mountain road with no guardrails or room for error, thus hubby’s concern was most definitely warranted for several reasons. Hmm, was the thin air and lack of oxygen effecting me? Possibly! 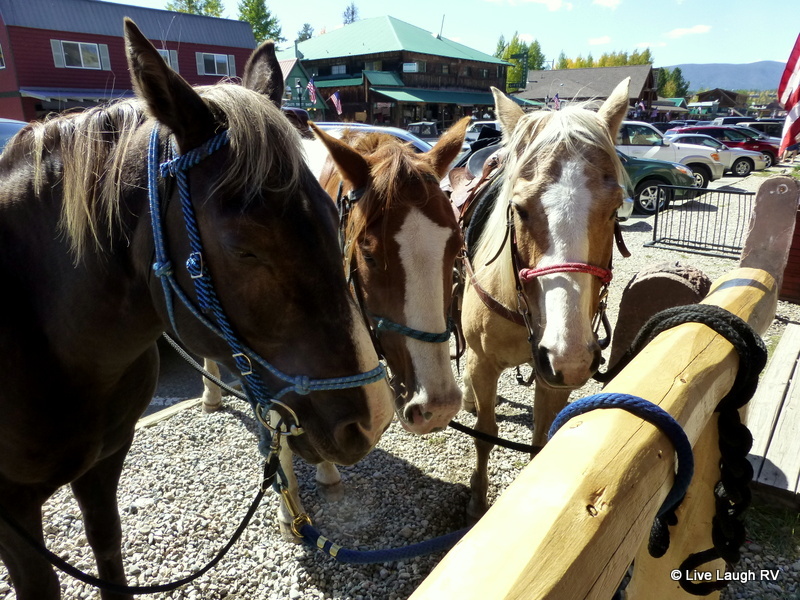 Safely parked in the parking lot….. with a smirky little chuckle, Al says, “You don’t plan on doing anything silly like hike this trail, do you…. especially since you’ve already experienced double vision?” “No hon, not to worry. I’ll just walk up to that sign up there. Ok?” Ah, we both knew better. Of course I was taking that trail. 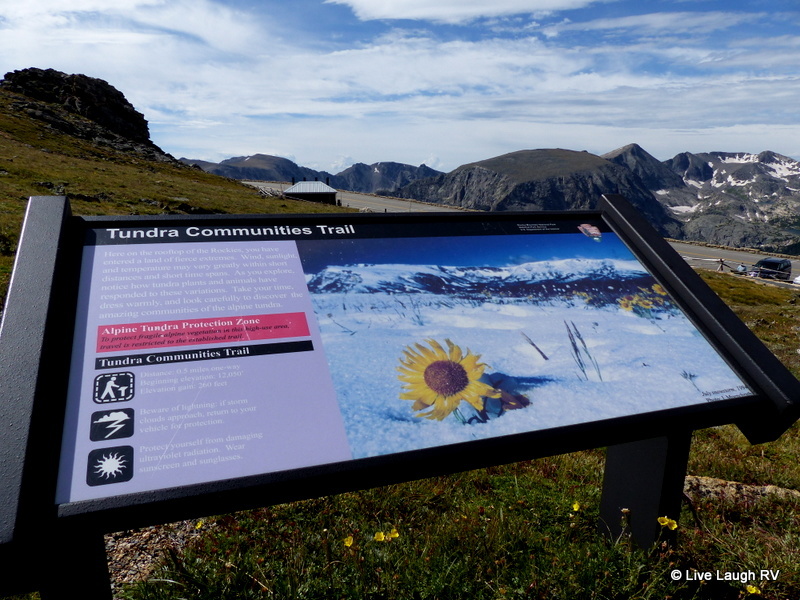 The Tundra Communities Trail is a 1.1 mile hike. The first quarter mile is taxing considering it’s at 12,100 feet in elevation, but it levels out after that. 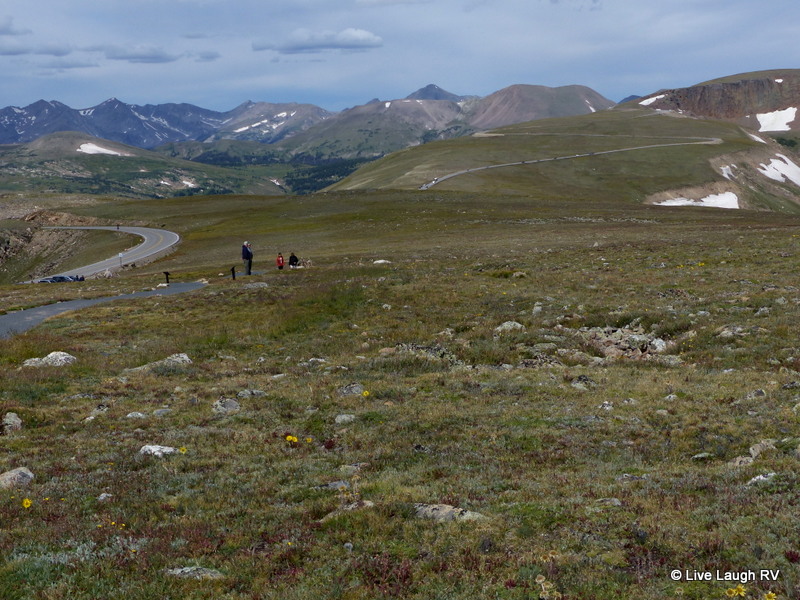 The trail winds through alpine tundra scattered with delicate wildflowers during the months of July and August. 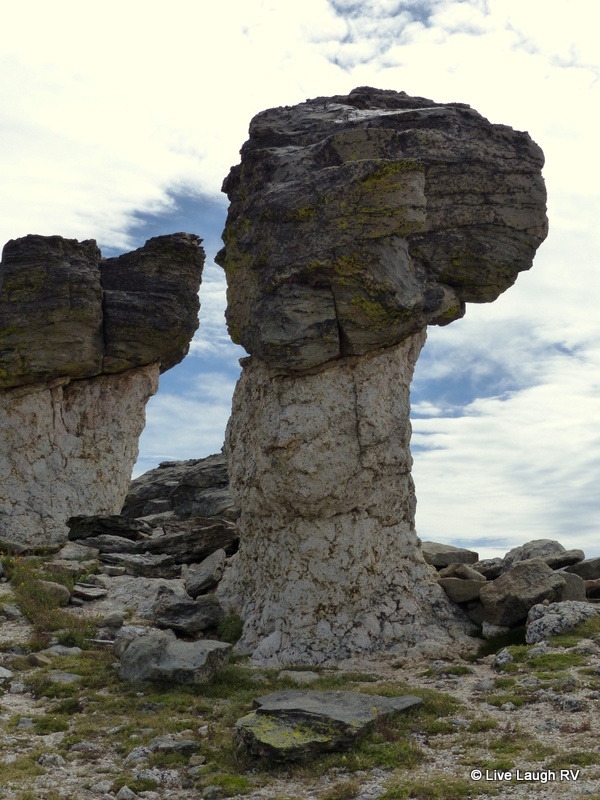 The trail eventually leads to Mushroom Rock. Since I was having a little trouble breathing and felt a little woozy, I started doing some deep yoga breathing. 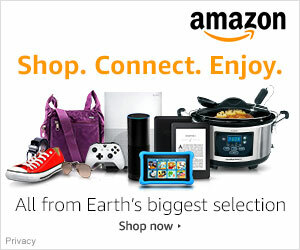 My friend, Carol, would be so proud! The deep breathing was working so I continued my stroll. “So how much fricken further is that mushroom rock?” I wondered. I kind of promised Al I wouldn’t venture further than the first interpretive sign, but here I was already further up the trail and he was now at that first interpretive sign. I waved to him, he waved back. I pointed in the direction of the trail and he waved me on. That was his way of saying it’s ok, go ahead without me. Not that I needed his permission mind you, but out of courtesy for his concern for my well being I did want him to know where I was venturing, as if he didn’t already know. 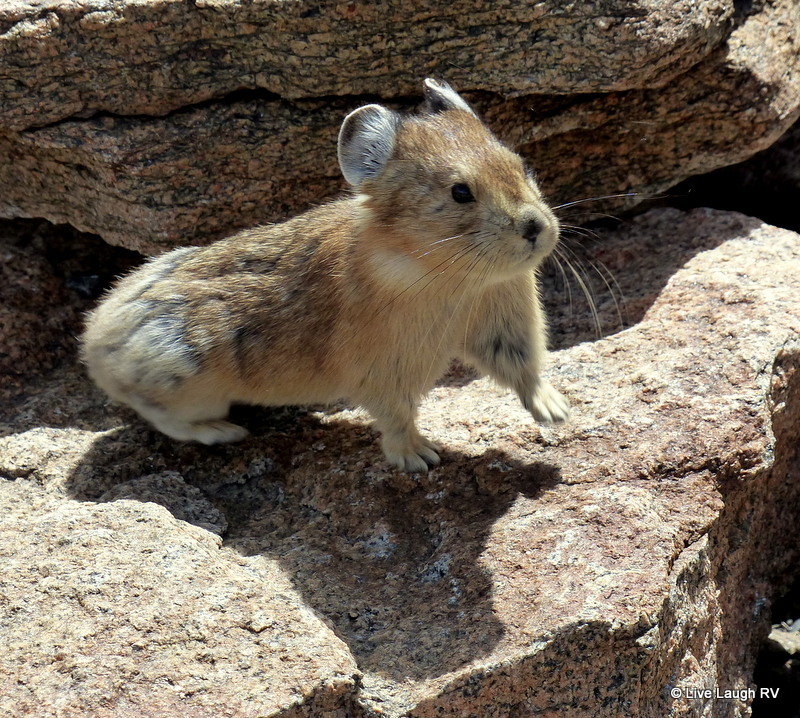 I captured a couple photos of Mushroom Rock but more importantly I captured several shots of the cute little Pikas. 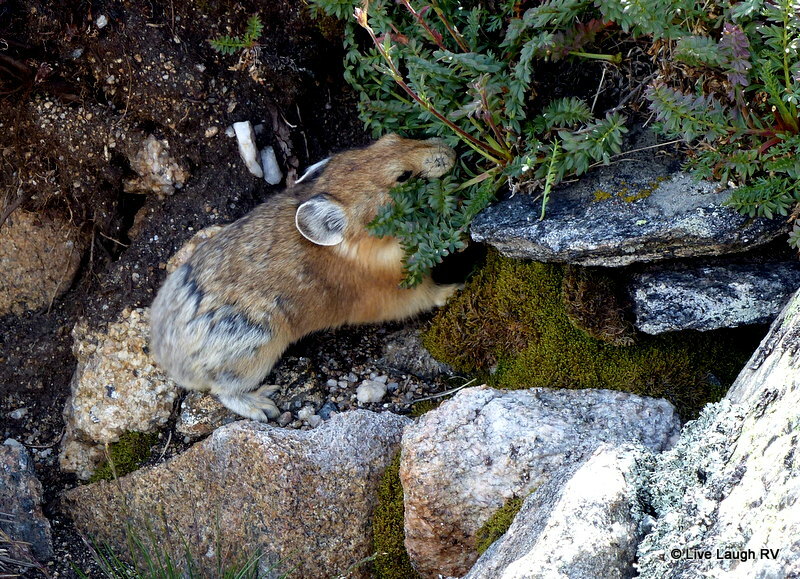 I was so engrossed trying to follow the fast Pikas that I could’ve cared less about any symptoms of hypoxia. 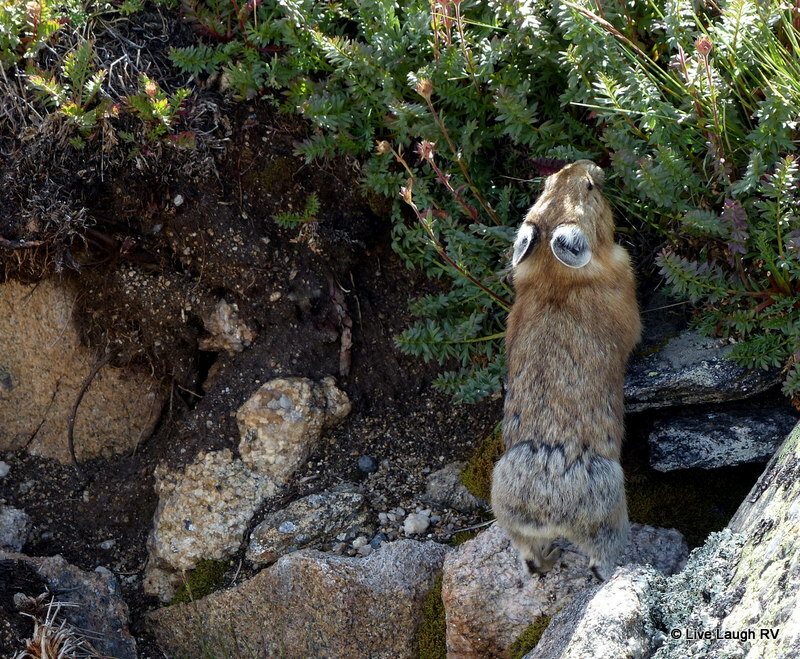 Gosh, they are so fast as they scurry between, up, and over the boulders. I was lucky to capture any photos at all. 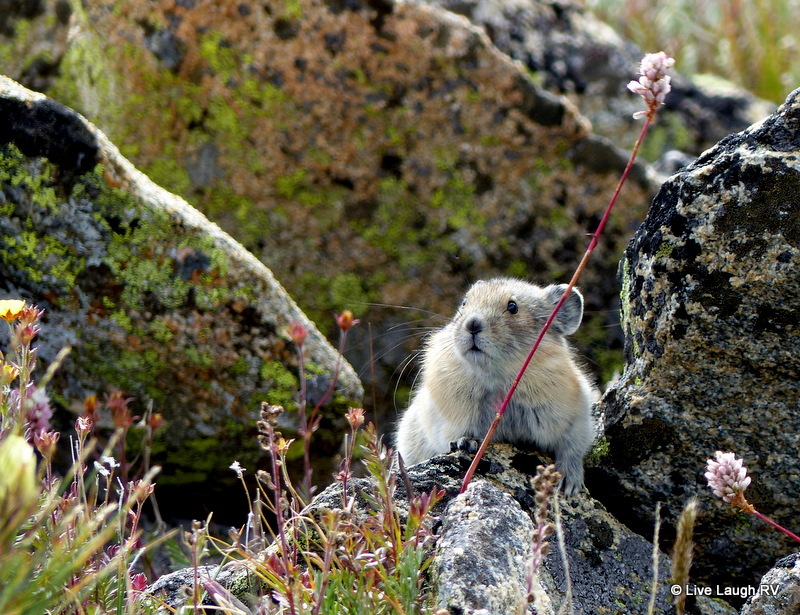 Trust me when I say I took lots of photos of rock and vegetation with no Pika in the frame … sigh! 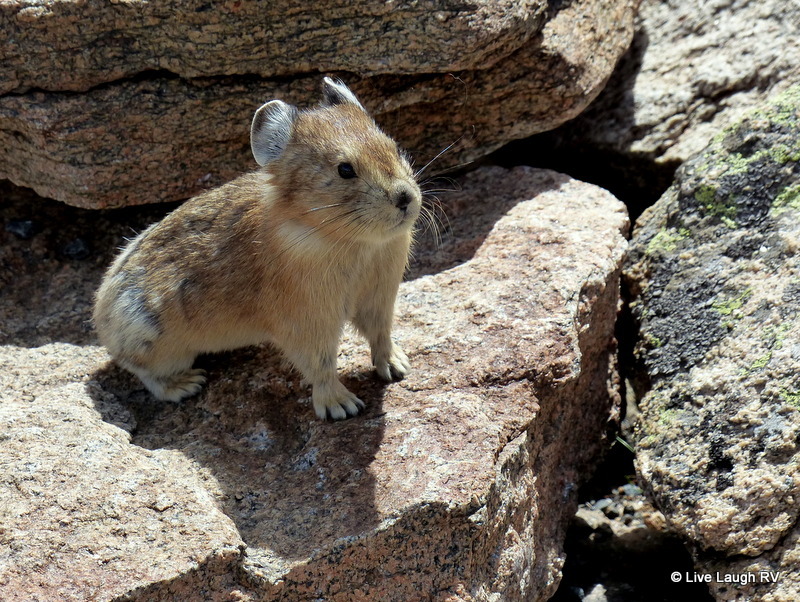 A Pika – they have the cutest little butts! 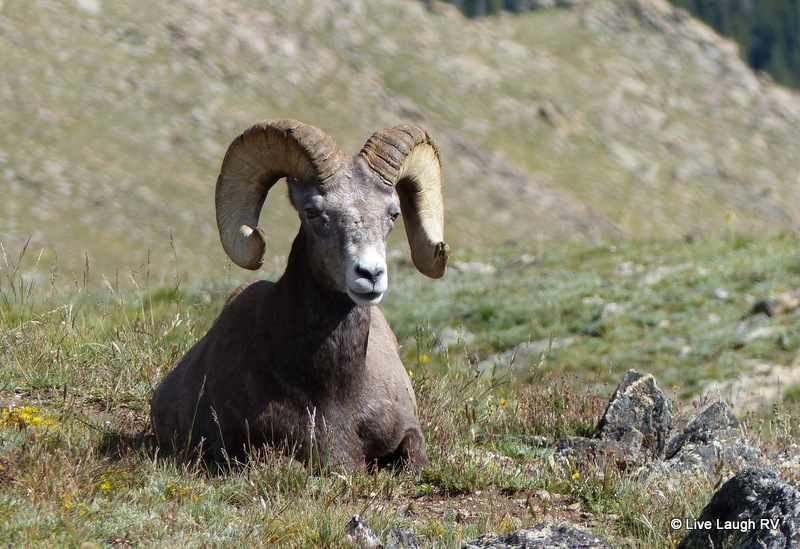 Although our perfect day continued with sightings of bighorn sheep, elk, and moose the sightings of the Pikas will remain my highpoint of the day. 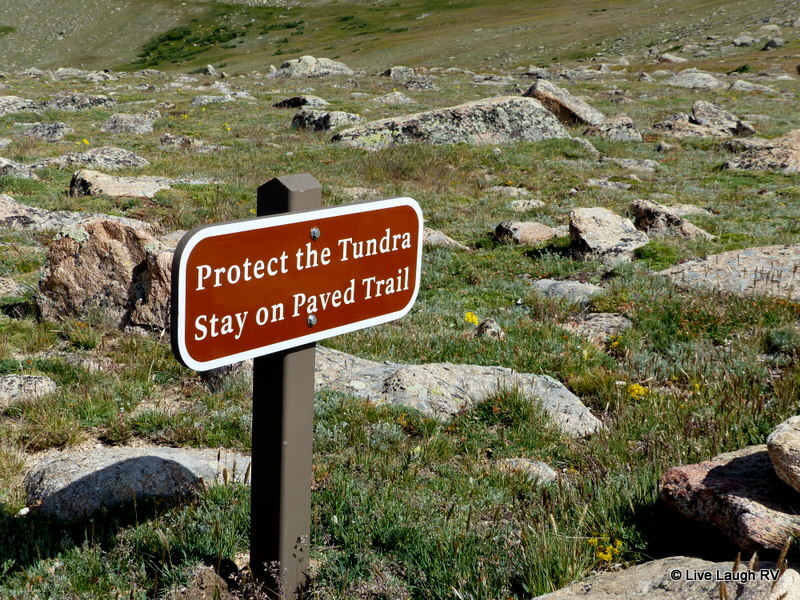 There’s also something about the tundra and its fragile ecosystem that intrigues me.